Kate: Die monster! You don’t belong on this volleyball team! Kei Tsukishima: It was not by my hand that I am once again a member of the Karasuno High Volleyball Club. I was called here by fans who wish to pay me tribute. Kate: Tribute!?! You stink up the screen and just aggravate your teammates! Kei Tsukishima: Perhaps the same could be said of all cooldere characters . . .
Kate: Your words are as empty as your character arc! Karasuno ill needs a middle blocker such as you! 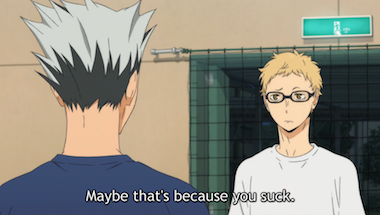 Kei Tsukishima: What is an ace? (flings his Pocari Sweat bottle aside) A miserable little pile of dumps! But enough talk. . . . Have at you! Posted in: Editorials, Humor | Tagged: Haikyu! !